There were many forbidden things for me as a boy. Because of the strict Christian religion in which I was raised, there were many things that “normal” people had or did that I could not have or do. As a boy, I thought the most manly and cool instrument I could possibly play was the guitar. No, not the acoustical guitar, but the electric bass guitar. If I was going to learn any instrument, it had to be piano. After mastering piano, mom told me that she’d let me move on to the acoustical guitar – the best compromise my fledgling negotiation skills could get me. I agreed to the piano lessons and told myself that I could endure a year of piano to reach the goal of learning the guitar. My piano teacher’s name was Lana. She was funny and liked me for being left-handed. After soon developing into her favorite student, she also gave me a keyboard. You have no idea what the possession of a keyboard does to the ego and self-confidence of a 10 year-old boy. Piano lessons were now becoming the highlight of my week. Making this whole piano experience even better was Lana’s 16 year-old daughter Megan who became my first crush. Had my mom discovered my crush (also strictly forbidden), piano lessons would have been over, and I would have been grounded for years. But I was smitten by Megan – a tall, sophisticated, pretty brunette. While her mom would tutor other students, Megan would occasionally sit down with me and give me a few piano tips or play some advanced song for me while I sat next to her in speechless adoration. Since the lessons were held at the recreation center, after my session was over, I’d go over and watch Megan as she practiced her cheer-leading dance moves and flips on the mats. I’m sure I just stood there starry eyed and slack jawed. From the tattered remnants of childhood memories, there is no indication whatsoever that Megan especially liked me. But that mattered little to me and my boyish fancies. I thought it was the best year of my life and tried hard to hide this one-sided romance from my mom. 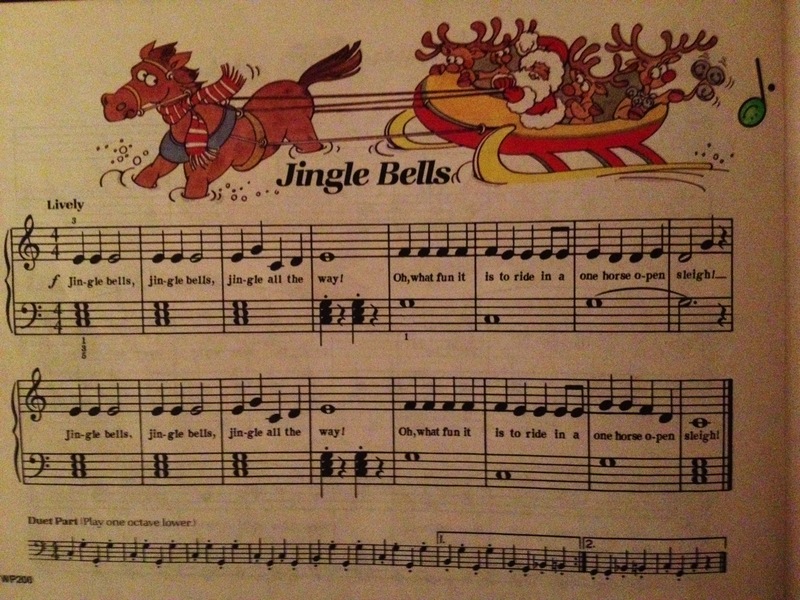 The last song to learn in our piano book was “Jingle Bells”. Because of my parent’s religion and views on Santa Claus, this was not a song I was going to learn. My mom had specifically told Lana that I was not to learn or play “Jingle Bells”. I had a rebellious streak. Because my mom didn’t want me to learn the song, I was determined to learn the song. But how? My piano teacher had been instructed to skip that song for me, so it seemed that again my mom’s wishes would trample my dreams. But wait, there was the amazing Megan. When that light bulb flickered on, I congratulated myself on my genius. I had created the perfect situation. Not only would I be able to learn the forbidden song, but I’d also get to learn it from my crush. Life was perfect. And learn it I did. Megan was more than willing to teach me, and after a few incredible keyboard sessions, I was the proud (but silent) master of “Jingle Bells”. To this day, I don’t think my mom knew about my crush or my rebellion. But then, parents do seem to have that uncanny perception of the evils perpetuated by their children – so who really knows? I just know that I got to play “Jingle Bells” with the love of my 10 year-old heart, and that was all that mattered.